If you have a tooth ache or require root canal therapy in Melbourne, please contact us for a consultation at Unity Dental. We accept emergencies every day. Our dentists will listen to your symptoms and answer any questions. Our dental team will examine your teeth, which may include taking x-rays to help plan a customised approach for your root canal treatment by revealing the number, size and curvature and depth of the roots. This will help to determine the complexity of your case. 4. and the treatment would only take less than half an hour. Modern treatments including laser allow us to complete most root canal therapies in a single visit. No waste of your time and multiple injections and multiple visits.This is subject to case assessment and appropriateness of this procedure. 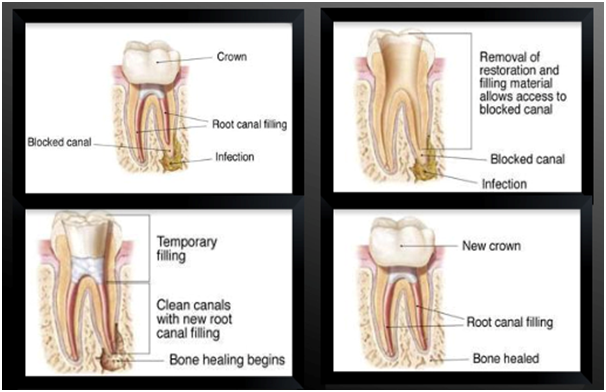 Root canal treatment can take several appointments, depending on how complex your tooth is. Teeth may vary in shape depending on the number, length and curvature of the root canals. Sedative dressings and temporary fillings may be placed inside your tooth between each visit to help settle the surrounding tissues and destroy remaining bacteria. In between visits you can use your tooth for chewing, but some care should be exercised. During the root canal treatment your tooth will be isolated and protected with a sheet of rubber (“rubber dam”). The rubber dam isolates the tooth, so only the tooth can be seen during the root canal treatment. This prevents debris from within the tooth entering the mouth, or saliva and bacteria from the mouth entering the tooth during the root canal treatment process. A metal band may also be placed around your tooth, to protect the tooth and help retain the temporary filling. This band remains in place until the crown of the tooth is restored at the final appointment along with the root canal filling. It is necessary to take a number of radiographs (commonly called x-rays) during the root canal treatment – these are required to check various treatment stages. Since the roots are under the gum and in bone, the root canals cannot be seen with the naked eye and can only be visualised using the assistance of radiographs. Root canal treatment is a comfortable procedure and it involves no pain as the tooth will be anaesthetised with local anaesthetic during treatment. However, sometimes you may have discomfort after an appointment due to inflammation in the surrounding tissues – this is usually relieved by the dressing that your dentist puts in your tooth. Sometimes a mild analgesic may be required. If you experience severe pain, or if your discomfort lasts for more than several days, then you should call us for advice. Root canal treatment has allowed healing and regression of this painful infection over a 6 month period post treatment.